The crops are where it is at! That is the great benefit of aquaponics, enjoying the veggies and fruits when they're ready to be eaten. The nitrogen cycle occurs due to the bacteria in the root systems, as the crops are growing. This is where the water is filtered and cleaned before it returns back to the fish. Without crops the device <>can not function correctly. Studies have shown that crops were shown to be an effective means of water-purification for aquaculture. Growing plants with aquaponics in your backyard in the soil is labor-intensive and takes up precious space. Soil farming is sort of a knee jerk response. You see the plants wilting and add water, plants yellowing and add nitrogen or compost. 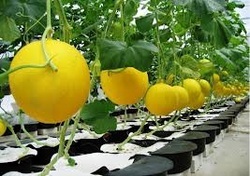 Aquaponics takes care of this automatically, without much thought except to assure the stream of water. In case the electricity stops or a pump fails the crops will survive several days up to two months depending on the temperature, but obviously the fish will die sooner. The nutrient rich water reaches all plants and because it only passes through, only what is needed can be used. Even with great plant protection there are lots of nitrates flowing out the drains thanks to all of the fish species, enough actually to power up another group of grow beds. This is not a concern unless the water is muddy in the fish tank. We have found that 6-8 grow beds per 400 gallon tank is an excellent operating number. Tomatoes, Peppers, Onions, Cucumbers, Pak Chov, Squash, Lettuce, Basil, Begonias, Impatiens Peas Beets, Swiss Chard, Black Seeded Simpson, Watermelon, Chives, Cabbage, Redina Lettuce, Endive, Amaranth, Celery, Tatsoi, Collard, Garlic, Chives, Courgette, Cilantro, Most common household plants, Cantaloupe, Mustard, Mints, Beans, Taro, Spinach, Parsley, Kale, Dill Rice, New Tomatoes. Be sure you purchase organic seeds for your system, so that you know precisely that your crops will be 100 % organic, if you want have the finest tasting vegetables. This way you'll appreciate the real taste of freshly harvested vegetables in the comfort of your home. What could be better than that? !